PREHISTORY? How do I teach my children where prehistoric cavemen fit into the Bible? How do I teach my children where the prehistoric cavemen they learn about at school fit into the Bible? Firstly you must be very clear about one thing: the God who was there in the beginning, has revealed there is no such thing as earth’s pre-history! The God who created all things has told us about it from Day 1! I was recently reading a Bible story about Noah’s Ark to a 4 year old, and I asked about the animals he could see. Giraffes, lions, monkeys – he got them all. Then I asked him if he could see any dinosaurs, and if not, why not? His reply was they had all died out by then. He had learned at his kindergarten school that dinosaurs died out millions of years ago – long before there were people. And in doing so he was well on his way to being brainwashed into believing the Bible is not about the real history of the world. Yes, it means you must be more careful about where you send your kids for education, and you must teach them carefully that God has told us all we need to know “from the very beginning”. There is no such thing as pre-historic time. 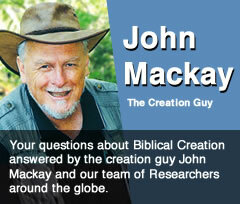 So where do you fit cave man into Biblical history? They actually do get a mention in the Bible, but not in the beginning. Let’s do a brief survey of human history from the Bible. Adam and Eve were created in the image of God, and started out living in a garden. When they were expelled from this they, and the next generation, were farmers, growing crops and tending livestock. They were not hunter gatherers. After Cain murdered his brother he became a wanderer, and eventually built a city. His descendants worked with metals and had high technology. There was nothing primitive about true early man, in contrast to the evolutionary stories of brutish cave men, as seen on TV, in movies, and taught in schools. By the time of Noah, the human race had degenerated morally, but Noah’s family still had the knowledge and technology to build the Ark. Following the Flood, Noah’s descendants had the knowledge and technology to build a city and the Tower of Babel. However, after the judgement at Babel the human race was split up into a number of small groups who became separated from one another in language straight away, and eventually geographically dispersed. This would have resulted in a profound loss of knowledge and technology, as the scattered groups had to survive in new environments with whatever knowledge and skills already existed in each small group. If they found themselves in a cold, harsh environment a cave would provide a suitable place of shelter and safety. Think carefully (as well as politically incorrectly) about the Australian Aboriginals, who had neither cities nor farms when Europeans arrived in Australia, but were descended from those who had left Babel as advanced city, tower and boat builders, and lost their knowledge and technology as they migrated from the middle east in at least three migratory groups to end up in Australia. They were not primitive people on the way up, but advanced people who had gone downhill to the stone age. Just because people lived in caves does not make them ignorant or stupid. The beautiful artwork in many of the caves in France from the classical cave man – the Cro-Magnon people are evidence in themselves that living in a cave is not the result of evolving upward, but often a smart solution to an accommodation problem as you migrate into new unsettled areas. If you visit the Mississippi region in the USA you can find caves where the early European settlers, fresh from an advanced civilization, first dwelt in caves until they built new cities. And in Australia – visit our outback opal mining regions where anyone with a brain is a troglodyte (cave man). Because it is so hot, it is just sensible to make your houses, churches etc. a man-made cave. And where can you read about cave dwellers in the Bible? The first cave dwellers mentioned in the Bible are Lot and his daughters after the judgement on Sodom. Some cave dwellers were brutish and ignorant, as the outcasts from society described in Job 30:1-8, but for some a cave was simply place of refuge in times of turmoil and war, e.g. Judges 6:2, I Samuel 22:1, I Kings 18:4, Hebrews 11:38. Thus, cavemen are the result of either degeneration of the human race and loss of technology, or the result of a sensible solution to an environmental problem. Cavemen are never the beginning of an upwardly evolving human race making primitive attempts at technology.